The European Union on Monday launched it’s first naval operation to try to stop human-traffickers from bringing migrants across the Mediterranean to Europe. The naval operation, which was officially launched by EU foreign ministers meeting in Luxembourg, will operate in international waters and airspace until the EU can secure a U.N. Security Council resolution endorsing its effort and permission from Libyan officials to enter their territory. According to the EU foreign policy chief Ms Federica Mogherini, EU will start implementing the first phase of the operation in the coming days. This covers information-gathering and patrolling on the high seas to support the detection and monitoring of smuggling networks. She told reporters that “The targets are not the migrants. The targets are those that are making money on their lives and too often on their deaths,.” The EU aims to “dismantle the business model” of the traffickers by destroying their boats, she said. 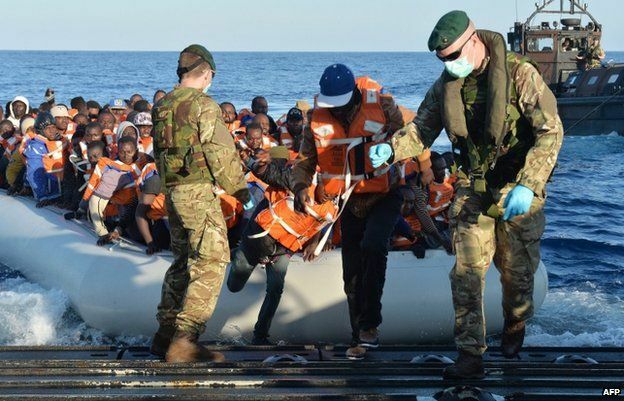 However, the U.N. has been slow to endorse the EU naval plan amid criticism from refugee groups that the move will only deprive migrants fleeing poverty and conflict of a major way to escape, rather than address the roots of the problem. Meanwhile, dozens of boats set off from Libya heading to Europe each week, with Italy and Greece bearing the brunt of the surge of migrants. So far this year more than 100,000 people have entered Europe, with some 2,000 dead or missing during the risky quest to reach Europe.